Helen (Serafine) Perro of Ashland passed away Tuesday, January 15, at age 78. Helen was born July 16, 1940 at St. Francis Hospital in Trenton, New Jersey. 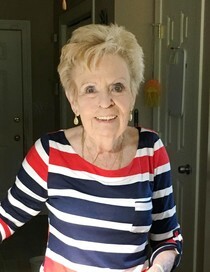 She is preceded in death by her husband of 53 years, Francis "Frank" Perro, who passed 6 days prior, and also by her parents, Daniel and Helen (Westwood) Serafine, and her brother, Daniel Serafine. Helen and Frank were long-time residents of N. Fort Myers, FL, where she worked as a hairdresser, owned a hobby shop, and ran a charter service before retirement. She and Frank were avid boaters and loved to explore the country in their RV before moving to Ohio in 2007 to be near family. Helen had a passion for flowers, hummingbirds, wind chimes, and fine jewelry. She adored her dogs and was always working with ceramics, stained glass, and painting. She was known for her fiery wit, her infectious laugh, and for the love she showered on her family. Helen is survived by her daughter, Frances "Fran" Swaisgood; her four grandchildren, Richard, Jennifer, Miki, and Daniel (Madu); her six great-grandchildren, Justin, Felicia, Miguel, Eric, Helen II, and Samara; and her three great-great-grandchildren, Aiden, Lana, and Chancellor. At Helen's request, the family will be holding a private memorial.